Bonjour! It's our last night in Paris, we've had two wonderful days here and have been so busy I haven't had a chance to update this. So I'll back track. Wednesday we jumped on the bus from Munich to Paris. It was a 13 hour bus trip, that's a long time on a bus! Especially feeling a bit precious. We'd visited the hostel bar on the Tuesday night for a drink, which ended up in quite a few pints of beer (be proud Daniel, I'm drinking beer) so an entire day on a bus wasn't the easiest on Wednesday. The traffic was ridiculous and it rained a fair bit, but other than that we made it to Paris safely and at about 9.30pm. We showered, walked around the hostel area (the ghetto) and had a good night sleep! Thursday we went to Disneyland. About an hour on the trains there from our hostel. It's a magical place! We lined up for our first ride not even paying attention to what it was, and it was a ghost train, possibly the least scary one on the planet! We read the signs from then on :) ride after ride and photo after photo and it was 6pm! Kristen indulged in some lovely souvenirs, I bought a pretty silver ring with Mickey mouse ears (it's nicer than you're imagining) and we were off home! We had some terrible pizza & pasta for dinner near our hostel and headed back for the hostel bar. We made some Aussie friends who are also doing busabout, Australians are absolutely everywhere! That brings us to today! We started the day with a free walking tour. About 3.5 hours in length, we went to all of the famous sites! We didn't have time to go into any museums or attractions, we admired from afar though. 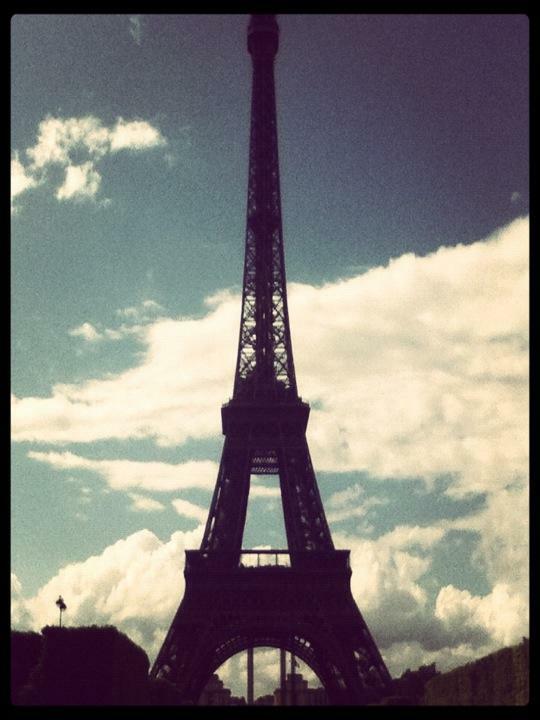 We did spend almost 2 hours admiring the Eiffel tour, it's stunning! The weathers been crazy, beautiful sun one minute, crazy rain the next. Bit like home! We had a really good guide, really interesting and we learnt a fair bit. We then went on a night bike tour. Also amazing, so good to do that stuff on bikes. Loved it! We got rained on and ended up home pretty late and ready for bed now! Next stop Bruges! Fun fact: There are many equestrian statues (statues with horses) around not only Paris but Europe as well. As a general rule you can tell how the rider (usually a notable character eg. Joan of arc) died by how the horse is standing. If they're feet are all planted, they died of natural causes, if they're front legs are raised, they died in battle, and if two other legs are off the ground then they died of unnatural causes, murder.